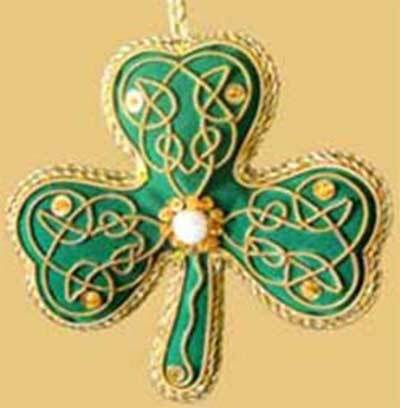 This Irish Christmas ornament features an intricately decorated velvet shamrock with gold thread Celtic interlacing. The shamrock ornament is enhanced with bright shining beads and along with glittering sequins. The shamrock Christmas ornament is fully decorated on both sides; the dimensional design measures 4" wide x 3 1/2" tall. The Irish ornament is made in Ireland by Islandcraft and it is gift boxed with shamrock and Celtic knot history cards, complements of The Irish Gift House. The three-leafed shamrock was used by St. Patrick to explain the Holy Trinity when he brought Christianity to Ireland in the 5th century A.D. Ever since, March 17th is celebrated as St. Patrick’s day.